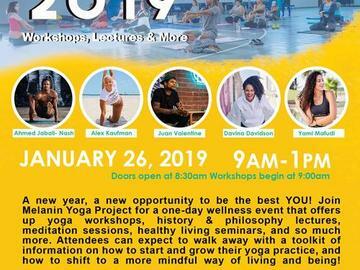 Melanin Yoga Project Expo is an event that offers up yoga workshops, lectures, meditation sessions, and more that will focus on overall health and a holistic well-being. Attendees can expect to walk away with a toolkit of information from our community of health practitioners and yoga teachers with the intent to support your well-being on and off the yoga mat. The theme for this upcoming expo will focus specifically to strengthen your core, improve your digestion, and to guide you to trust the body's intuition. Melanin Yoga Project ™ is a non-profit organization. We connect, educate, and inspire underserved communities through yoga, wellness, and mindful living. Your donations will go towards our current initiatives; yoga in communities, yoga in schools, and scholarships for future yoga teachers. DOORS OPEN AT 8:30am. PLEASE BRING a mat, towel, and water. Yoga mats will not be provided at this event. Cash will not be taken at the door. Please register for this event to reserve your spot.